Distinctive features: Iconic design by Mario Bellini utilising a rubber membrane over the keyboard. Display is 12 digits printout on thermal paper. Power supply: 4.8 v, built-in rechargeable cells. Integrated circuits: SGS Microelettronica 2051A & 2052B, here date-coded to weeks 42 and 43 of 1973. Without charging unit 247 x 120 x 52 mm (9.75" x 4.75" x 2.0"), with charging unit fitted 308 x 120 x 52 mm (12.1" x 4.75" x 2.0"). Made in Italy by Olivetti. 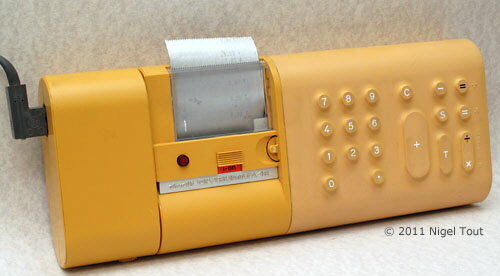 The design of the Divisumma 18 is due to Mario Bellini who began working for Olivetti as a Chief Design Consultant in 1963. He was responsible for producing very stylish designs for office equipment rather than the very utilitarian looks of most of the competition. See "Olivetti Electronic Calculators and the Designs of Mario Bellini" in the Collecting Calculators section of this site. 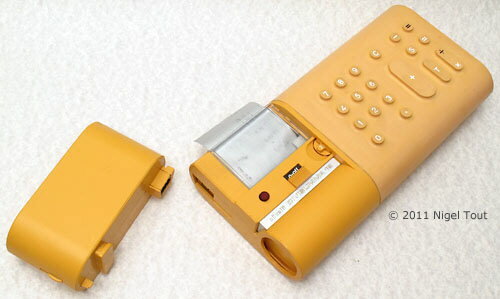 The calculator with the charging unit fitted to the left end. The Olivetti Divisumma 18 is a large calculator, too large to be called a pocket calculator. The battery charging unit neatly clips on to the left end of the calculator. 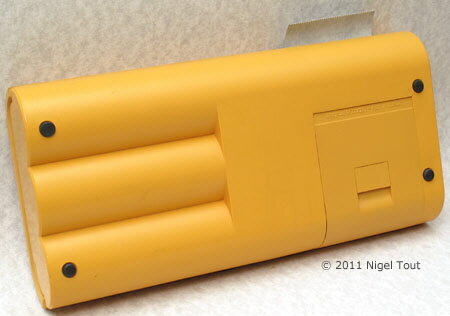 The rear of the casing maintains the stylish design of the calculator. Removing the rear cover shows that the stylish outside design is not entirely determined by what is inside. 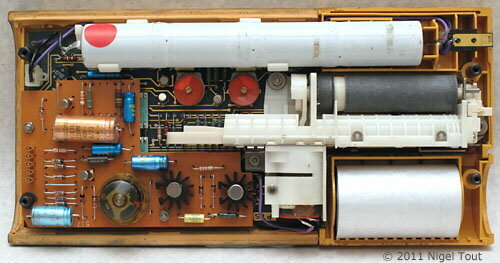 The printing mechanism can be seen on the right, the two circuit boards are on the left, and the rechargeable cells are along the top. 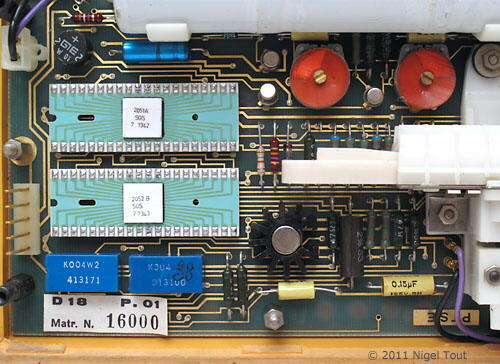 After removing the upper circuit board the lower board is revealed with the two integrated circuits manufactured by SGS, here date-coded to weeks 42 and 43 of 1973. 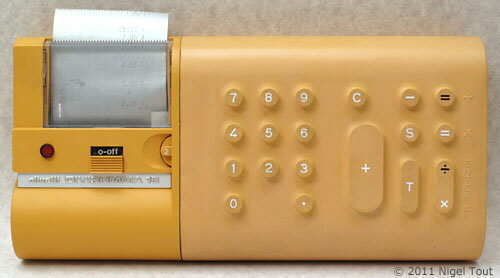 This calculator was selected for its collection by the Museum of Modern Art in New York, where they especially admired its tactile qualities.